The most direct way to study how alterations in the way we measure temperature affect the registered temperatures is to make simultaneous measurements the old way and the current way. New technological developments have now made it much easier to study the influence of location. Modern batteries have made it possible to just install an automatically recording weather station anywhere and obtain several years of data. It used to be necessary to have nearby electricity access, permissions to use it and dig cables in most cases. Jenny Linden used this technology to study the influence of the siting of weather stations on the measured temperature for two villages. One village was in North Sweden, one in the West of Germany. In both cases the center of the village was about half a degree Centigrade (one degree Fahrenheit) warmer than the current location of the weather station on grassland just outside the villages. This is small compared to the urban heat island found in large cities, but it is comparable in size to the warming we have seen since 1900 and thus important for the understanding of global warming. In urban areas, the heat island can be multiple degrees and is studied much because of the additional heat stress it produces. This new study may be the first for villages. Her presentation (together with Jan Esper and Sue Grimmond) at EMS2014 (abstract) was my biggest discovery in the field of data quality in 2014. Two locations is naturally not not enough for strong conclusions, but I hope that this study will be the start of many more, now that the technology has been shown to work and the effects to be significant for climate change studies. A small map of Haparanda, Sweden, with all measurement locations indicated by a pin. Mentioned in the text are Center and SMHI current met-station. The Swedish case is easiest to interpret. The village [[Haparanda]] with 5 thousand inhabitants is in the North of Sweden, on the border with Finland. It has a beautiful long record, measurements started in 1859. Observations started on a North wall in the center of the village and were continued there until 1942. Currently the station is on the edge of the village. It is thought that the center did not change much any more since 1942. Thus the difference could be interpreted as the cooling bias due to the relocation from the center to its current location in the historical observations. The modern measurement was not at the original North wall, but free standing. Thus only the difference of the location can be studied. As so often, the minimum temperature at night is affected most. It has a difference of 0.7°C between the center and the current location. The maximum temperature only shows a difference of 0.1°C. The average temperature has a difference of 0.4°C. The village [[Geisenheim]] is close to Mainz, Germany, and was the first testing location for the equipment. It has 11.5 thousand inhabitants and is on the right bank of the Rhine. Also this station has a quite long history and started in 1884 in a park and stayed there until 1915. Now it is well-sited outside of the village in the meadows. A lot has changed in Geisenheim between 1915 and now. So we cannot make any historical interpretation of the changes, but it is interesting to compare the measurements in the center with the current ones to compare with Haparanda and to get an idea how large the maximum effect would theoretically be. A small map of Geisenheim, Germany. 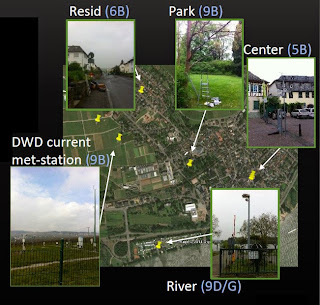 Compared in the text are Center and DWD current met-station. The station started in Park. The difference in the minimum temperature between the center and the current location is 0.8°C. In this case also the maximum temperature has a clear difference of 0.4°C. The average temperature has a difference of 0.6°C. The next village on the list is [[Cazorla]] in Spain. I hope the list will become much longer. If you have any good suggestions please comment below or write Jenny Linden. Especially locations where the center is still mostly like it used to be are of interest. And as much different climate regions should be sampled as possible. Naturally not all stations started in villages and even less exactly in the center. But this is still a quite common scenario, especially for long series. In the 19th century thermometers were expensive scientific instruments. The people making the measurements were often the few well-educated people in the village or town, priests, apothecaries, teachers and so on. 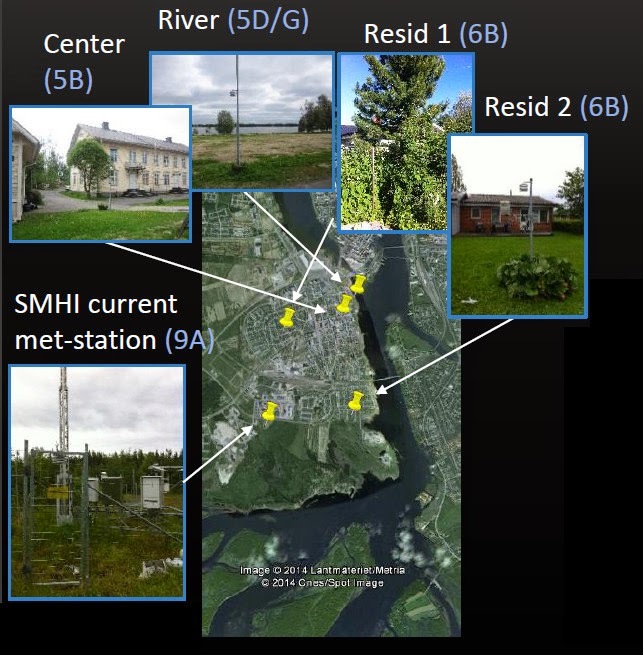 In Sweden we have many stations that have moved from a central location out to a location outside the village. ... We have several stations located in small towns and villages that have been relocated from the centre to a more rural location, such as Haparanda. In many cases the station was also relocated from the city centre to the airport outside the city. But we also have many stations that have been rural and are still rural today. Improvements in siting may be even more interesting for urban stations. Stations in cities have often been relocated (multiple times) to better sited locations, if only because meteorological offices cannot afford the rents in the center. Because the Urban Heat Island is stronger, this could lead to even larger cooling biases. What counts is not how much the city is warming due to its growth, but the siting of the first station location versus its current one. More specifically, it would be interesting to study how much improvements in siting have contributed to a possible temperature trend bias in the recent decades. The move to the current locations took place in 2010 in Haparanda and in 2006 in Geisenheim. Where it should be noted that the cooling bias did not take place in one jump: decent measurements are likely to have been recorded since 1977 in Haparanda, and since 1946 in Geisenheim; For Geisenheim the information is not very reliable). It would make sense to me that the more people started thinking about climate change, the more the weather services realized that even small biases due to imperfect siting are important and should be avoided. Also modern technology, automatic weather stations, batteries and solar panels, have made it easier to install stations in remote locations. An exception here is likely the United States of America. The Surface Stations project has shown many badly sited stations in the USA and the transition to automatic weather stations is thought to have contributed to this. Explanations could be that America started early with automation, the cables were short and the technician had only one day to install the instruments. When also villages have a small urban effect, it is also possible that this gradually increases while the village is growing. Such a gradual increase can also be removed by statistical homogenization by comparison with its neighboring stations. However, if too many stations have a such a gradual inhomogeneity, the homogenization methods will no longer be able to remove this non-climatic increase (well). Thus this finding makes it more important to make sure that sufficient really rural stations are used for comparison. On the other hand, because a village is smaller, one may expect that the "gradual" increases are actually somewhat jumpy. Rather than being due to many changes in a large area around the station, in case of a village the changes may be expected to be more often nearer to the station and produce a small jump. Jumps are easier to remove by statistical homogenization than smooth gradual inhomogeneities, because the probability of something happening simultaneously in the neighboring station is smaller. A parallel measurement in Basel, Switzerland. 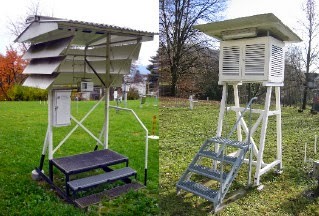 A historical Wild screen, which is open to the bottom and to the North and has single Louvres to reduce radiation errors, measures in parallel with a Stevenson screen (Cotton Region Shelter), which is close to all sides and has double Louvres. These measurements at multiple locations are an example of parallel measurements. The standard case is that an old instrument is compared to a new one while measuring side by side. This helps us to understand the reasons for biases in the climate record. From parallel measurements we, for example, also know that the way temperature was measured before the introduction of Stevenson Screens has caused a bias in the old measurements of up to a few tenth of a degree. With differences of 0.5°C being found for two locations Spain and two tropical countries, while the differences in North West Europe are typically small. To be able to study these historical changes and their influence on the global datasets, we have started an initiative to build a database with parallel measurements under the umbrella of the International Surface Temperature Initiative (ISTI), the Parallel Observations Science Team (POST). We have just started and are looking for members and parallel datasets. Please contact us if you are interested. 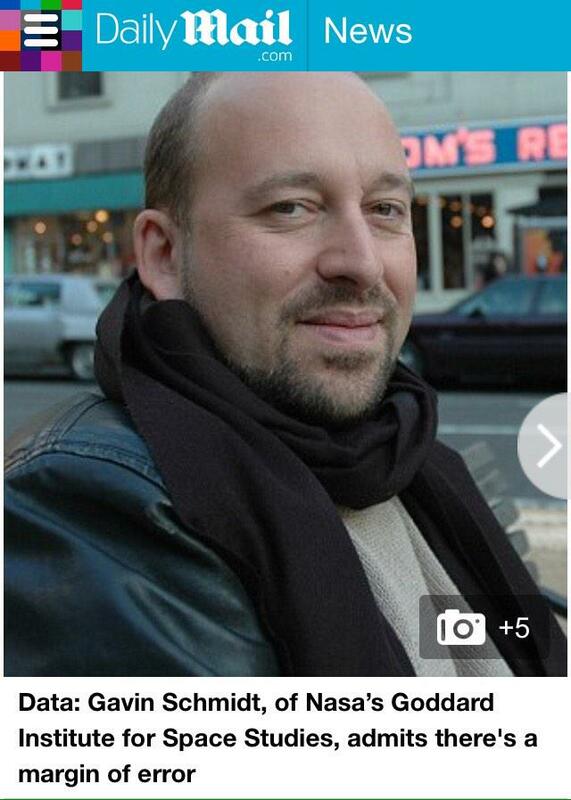 The look of Gavin Schmidt accurately portrait my feelings for the Daily Mail. It seems the word record has a new meaning. Up to now I had always thought that you set a record when you get the largest or lowest value, whichever is hardest. The world record in marathon is the fastest time in an official race. The worlds best football player is the one getting most votes from sports journalists. And so on. Climate change, however, has a special place in the heart of some Americans. These people do not see the question whether 2014 was a record in the datasets as an interesting question; the normal definition. Rather they claim, you are only allowed to call a year a record if you are sure that it was the highest value for the unknown actual global mean temperature. That is not the same. Last September a new marathon world record was set in Berlin. Dennis Kimetto set the world record with a time of 2:02:57, while the number two of the same race, Emmanuel Mutai, set the world second best time with 2:03:13. Two records in one race! Clearly the conditions were ideal (the temperature, the wind, the flat track profile). Had other good runners participated in this race, they may well have been faster. Should we call it a record? According to the traditional definition, Kimetto run fastest and has a record. According to the new definition, we cannot be sure that Kimetto is really the fastest marathon runner on the world and we do not know what the world record is. Still newspapers around the world simply wrote about the record as if it were a fact. When Cristiano Ronaldo was voted world footballer of the year 2014 with 37.66% of the votes, the BBC simply headlined: Cristiano Ronaldo wins Ballon d’Or over Lionel Messi & Manuel Neuer. According to the traditional definition, Ronaldo is fairly seen as the best football player. According to the new definition, we cannot tell who the best football player is. He had such a small percentage of the votes, journalists clearly are error prone and they have a bias for forwards and against keepers. In the sports cases it is clear that the probabilities are low, but hard to quantify them. In case of the global mean temperature we can and statistics is fun. All American groups were very active in communicating the probability that the global mean temperature itself was the highest in 2014. An interesting information quantum for the science nerd that may have put some people on the wrong foot. @windbarb yes. Individual years are statistically close, but 2014 btw 1.5 and ~3 times likeliest to be warmest yr.
And just for the funsies. * Interesting, that Germany, France and China do not have their own global temperature datasets. Okay, Germany makes an effort not to look like a world power, but one would have expected France to have one. China is making a considerable effort in homogenization lately and has a large network already. I would not be surprised if they had their own global dataset soon, maybe using the raw data collection of the International Surface Temperature Initiative. An informative article by Zeke Hausfather puts the 2014 record into perspective. The trend is important. Andrew C. Revkin with a long piece with a similar opinion. 2014 was an exiting year for me, a lot happened. It could have gone wrong, my science project and thus employment ended. This would have been the ideal moment to easily get rid of me, no questions asked. But my follow-up project proposal (Daily HUME) to develop a new homogenization method for global temperature datasets was approved by the German Science Foundation. It was an interesting year. The work I presented at conferences was very skeptical of our abilities to removed non-climatic changes from climate records (homogenization). Mitigation skeptics sometimes claim that my job, the job of all climate scientists, is to defend the orthodoxy. They might think that my skeptical work would at least hurt my career, if not make me an outright outcast, like they are. Knowing science, I did not fear this. What counts is the quality of your arguments, not whether a trend goes up or down, whether a confidence interval becomes larger or smaller. As long as your arguments are strong, the more skeptical, the better, the more interesting the work is. What would hurt my reputation would be if my arguments were just as flimsy as those of the mitigation skeptics. Not a nice message, but a large number of wonderful colleagues is happy to work with me on this review paper. Thank you for your trust. Last May at the homogenization seminar in Budapest, I presented this work, while my colleague presented our joint work on homogenization when the size of the breaks is small. Or, formulated more technically: homogenization when the variance of the break signal is small relative to the variance of the difference time series (the difference between two nearby stations). The positions of the detected breaks are in this case not much better than random breaks. This problem was found by Ralf, a great analytical thinker and skeptic. Thank you for working with me. Because my project ended and I did not know whether I would get the next one and especially not whether I would get it in time, I have asked two groups in Budapest whether they could support me during this bridge period. Both promised they would try. The next week the University of Bern offered me a job. Thank you Stefan and Renate, I had a wonderful time in Bern and learned a lot. Thus my skeptical job is on track again and more good things happened. For the next good news I first have to explain some acronyms. The World Meteorological Organisation ([[WMO]]) coordinates the work of the (national) meteorological services around the world, for example by defining standards for measurements and data transfer. The WMO has a Commission for Climatology (CCl). For the coming 4-year term this commission has a new Task Team on Homogenization (TT-HOM). It cannot be much more than 2 years ago that I asked a colleague what this abbreviation he had used "CCl" stood for. Last spring they asked whether I wanted to be member of the TT-HOM. This autumn they made me chair. Thank you CCl and especially Thomas and Manola. I hope to be worthy of your trust. Furthermore, I was asked to be co-convener of the session on Climate monitoring; data rescue, management, quality and homogenization at the Annual Meeting of the European Meteorological Society. That is quite an honor for a homogenization skeptic that is just an upstart. More good things happened. While in Bern, Renate and I started working on a database with parallel measurements. In a parallel measurement an old measurement set-up stands next to a new one to directly compare the difference between them and to thus determine the non-climatic change this difference in set-ups produced. Because I am skeptical of our abilities to correct non-climatic changes in daily data, I hope that in this way we can study how important they are. A real skeptic does not just gloat when finding a problem, but tries to solve them as well. The good news is that the group of people working on this database is now a expert team of the International Surface Temperature Initiative (ISTI). Thank you ISTI steering committee and especially Peter. In all this time, I had only one negative experience. After presenting our review article on daily data a colleague asked me whether I was a climate "skeptic". That was clearly intended as a threat, but knowing all those other colleagues behind me I could just laugh it off. In retrospect, my choice of words was also somewhat unfortunate. As an example, I had said that climatic changes in 20-year return levels (an extreme that happens on average every 20 years) probably cannot be studied using homogenized data given that the typical period between two non-climatic changes is 20 years. Unfortunately, this colleague afterwards presented a poster on climatic changes in the 20-year return period. Had I known that, I would have chosen another example. No hard feelings. That is how climatology treats skeptics. I cannot complain. On the contrary, a lot of people supported me. If you can complain, if you feel like a persecuted heretic (and not only claim that as part of your political fight), you may want to reconsider whether your arguments are really that strong. You are always welcome back. A large part of the homogenization community at a project meeting in Bucharest 2010. They make a homogenization skeptic feel at home. Love you guys. I was highly critical of IPCC AR4 Chapter 6, so much so that the [mitigation skeptical] Heartland Institute repeatedly quotes me as evidence that the IPCC is flawed. Indeed, I have been unable to find any other review as critical as mine. I know "because they told me" that my reviews annoyed many of my colleagues, including some of my RC colleagues, but I have felt no pressure or backlash whatsover from it. Indeed, one of the Chapter 6 lead authors said “Eric, your criticism was really harsh, but helpful "thank you!" So who are these brilliant young scientists whose careers have been destroyed by the supposed tyranny of the IPCC? Examples? Well, I don't think I got quite such a rapturous response as Eric did, with my attempts to improve the AR4 drafts, but I certainly didn't get trampled and discredited either [which Judith Curry evidently wrongly claims the IPCC does] - merely made to feel mildly unwelcome, which I find tends to happen when I criticise people outside the IPCC too. But they did change the report in various ways. While I'm not an unalloyed fan of the IPCC process, my experience is not what she [Judith Curry] describes it as. So make that two anecdotes. Maybe people could start considering whether there is a difference between qualified critique and uninformed nonsense. Valuing quality is part of the scientific culture.